Improv Zippy Pouches and First Etsy Sale! | sew. quilt. explore. 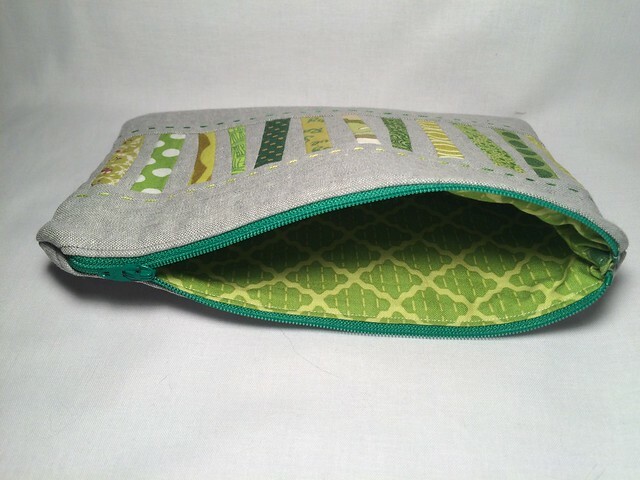 | modern quilting | tutorials: Improv Zippy Pouches and First Etsy Sale! This holiday I wanted to make most of my presents myself. I feel like if I can hand make things then they are more meaningful and unique. On the other plus side, they are "free." 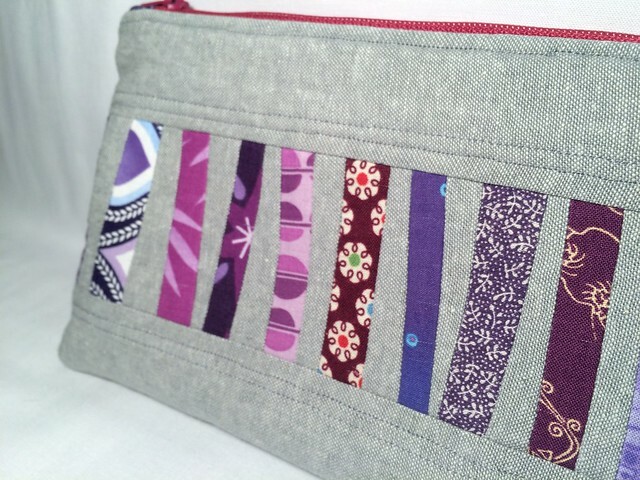 :) I wanted to make my girlfriend's sister a zipper pouch so I thought up a design in my head and went to work. The design that I came up with incorporates small scraps and also the fun improv quilting technique that I have come to love so much. :) I drew it up and cut out the pieces, made the middle panel, and added a top and bottom piece to complete the front. I trimmed it to the size I wanted and made the back piece the same size. It came together pretty quickly and it was super fun to make. Great project for an afternoon or some night sewing. I have been prepping to open an Etsy shop for about a year now, creating branding, moving to a real .com site, making business cards, etc. Veronica spurred me to get my act together and finally open it. She wanted to buy something from me. :) I took some pictures and wrote some postings and tada! I opened an Etsy shop!! You can find the link to my shop here! I made her a similar pouch with the same design and posted it in my shop the next day. She bought it right away and was my first sale!! I am super excited about finally opening my shop. I have done lots of commission work over the years but have always been scared to put myself out there and actually sell my creations. I'm sure you can relate, as artists, we never fail to see the imperfections in our work. 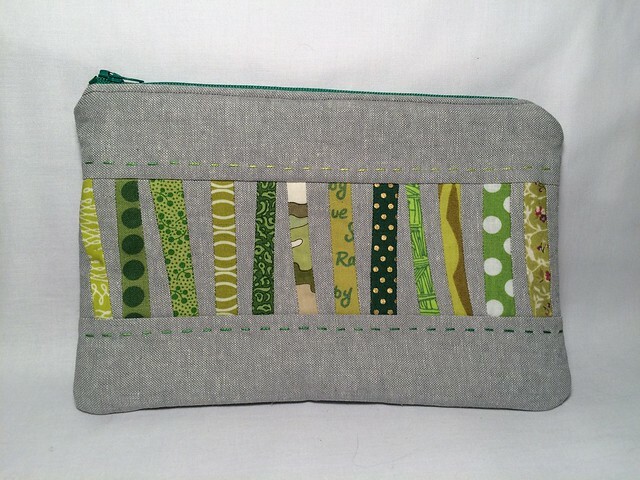 I just got an order of zippers in this week and will be making many pouches for my shop. I would love to hear what kinds of things you would like to see in a shop like mine. Right now I have quilts that I have made that I had good pictures for and am waiting on good weather to take pictures of some more. 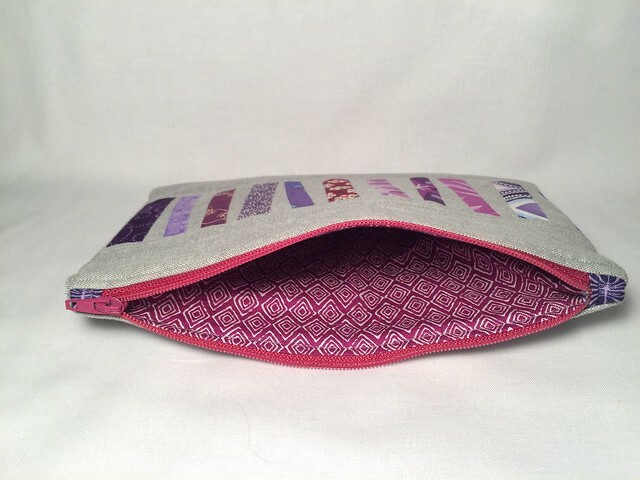 I would love to put more pouches, journal covers, and tea cozies, but am also thinking of doing some yoga accessories, as I have a great friend, Kathleen, that has asked me to work some stuff up for her and her yogi friends. Your zippered pouches are very cute. I love them both, but I'm particularly partial to the green one. 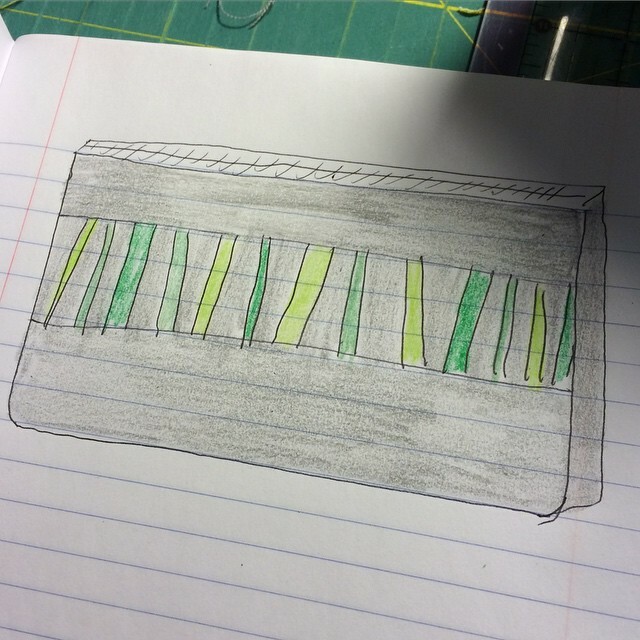 I like how the lining of the green pouch echoes the green stripes on the outside. Congrats on your Etsy shop, too. Congrats on your first etsy sale! Your pouches are awesome. I've noticed that its my most unique items that sell on etsy. I haven't had much luck with quilts (personally - I know others have) but I make some rummy mats (a card game) that have been doing awesome lately. Maybe the yoga stuff is worth a try? But your pouches should definitely sell too. They are so cute. A great scrap project - highly desirable! Very pretty pouches! There is something especially wonderful about the green one! Congratulations on your Etsy shop! And especially your first sale. 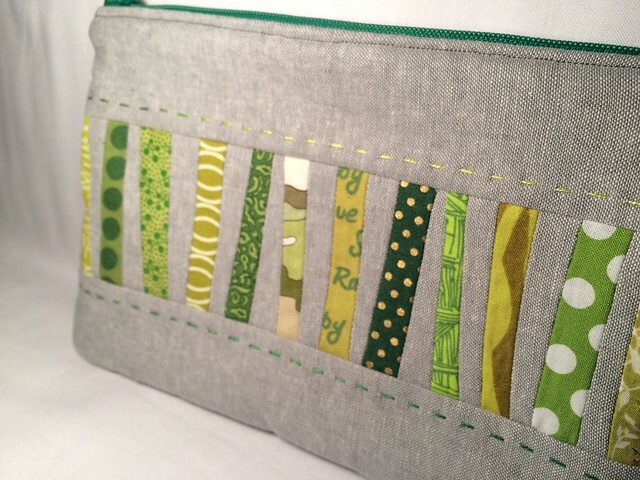 I love the pouches and what a great way to use up those tiny scraps! Thanks for sharing on Oh Scrap! These are cute! I like your choice of lining as well. Those are cute zippered pouches! Best use of little scraps! That pouch is so pretty. I love everything about it from the fabrics and colors to the variegated lines of big-quilting. Nice share. :) And congrats on your shop! I really LOVE those pouches!! I've seen a few tutes about making these pouches, but I love this improv, scrappy style, nice work, and nice touches of hand stitching. 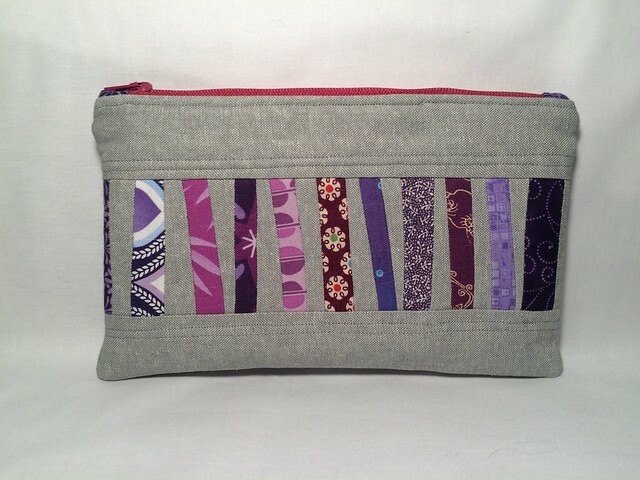 Love your strippy scraps on the pouches! Great use of your scraps. Love it! Very exciting! Congratulations on the shop and your first sale. LOVE your pouches! Such a lovely creation. You are really awesome at your work. One can save money and this is fun, too, cause you can design it however you want. By putting oneself on Etsy one moves into a different level of craft business, one that is growth oriented and more in tune with online shopping and social opportunities and resources.